I haven’t studied economic history enough to know (or at least to remember) what the causes of the Great Depression were. It might be a good idea for me to Wiki it because I believe with all my heart that we are currently living in a time of impending worldwide economic collapse. I don’t harbor any illusions that my coming to an understanding of the roots and causes of the Great Depression will prevent the onset of the next one, but I know that when we don’t learn from it, history has a way of repeating itself. So it might help me to more clearly see the signs of times if I were to revisit the Great Depression. I’ll put that on my list of Things To Do. My parents were young adults during the Great Depression. It made a big impact on their lives long after the depression was over. Just as my parents were molded by the Great Depression, a lot of my prepper ideas have their roots from the Y2K scare. (Y2K is the abbreviation for “Year 2000.”) That’s when I first became aware of the need to be prepared for world-changing calamities. For those of you too young to remember, or if you just weren’t paying attention at the time, Y2K was a scare that was born out of the growing pains of worldwide computerization. Computers run on data. One of the most common pieces of data used in computer databases is a date — month, day, and year — stored as numeric values for purposes of calculating… well, lots of things. Most early computer software was written to allow only two digit abbreviations to define each portion of a date, including the year (for example, June 28, 1907 would be 06/28/07). So instead of storing a year as “1907” it would just be “07”. It was assumed that you were talking about the 20th century. As we approached the dawning of the 21th century, some forward-thinking programmer was dealing with future events that crossed over into the 21 century and ran into the problem of dating. Anything that was going to happen in the year 2000 or beyond was understood by the software as being in the 1900s. Every calculation that was based on a date either gave the wrong answer (best case) or crashed the system altogether (worst case). Virtually every significant computer system in the world would be affected by this error — banking systems, public utilities, military applications, manufacturing, government, healthcare, everything! If steps weren’t taken to replace old hardware and software to accommodate date codes that used four digits to define a year rather than two digit year abbreviations, and do date math correctly, there was a real risk of computers malfunctioning on a global scale and the world suddenly reverting to the level of technology of the late 1800s overnight. Governments and businesses spent train loads of money to update their software and hardware to avert the problem. The result was that Y2K was rung in with traditional fireworks and celebrations, instead of the world going dark as power grids failed. 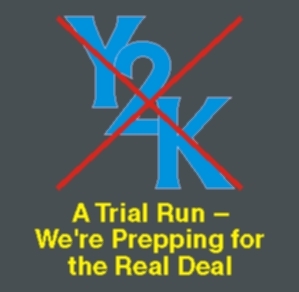 There were many skeptics in the run-up to Y2K. But let me repeat the first sentence of the previous paragraph: Governments and businesses spent train loads of money to update their software and hardware to avert the problem. 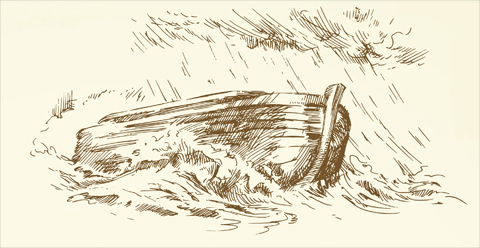 People who understood the problem and its implications weren’t skeptics — they were preppers! I was working at the global headquarters of a Fortune 500 company at the time leading up to Y2K. It was reported around the water cooler that the CEO of the company installed a 15,000-watt generator to keep the power running at his large home in the event of a Y2K blackout. So there were many skeptics and nay-sayers during Y2K, but the fact remains that businesses, industries, and governments fixed their computer systems (at great expense) so that they wouldn’t become part of the problem. The experts were believers, and they convinced their bosses who held onto the purse strings to become believers, too. They took the necessary actions to avert the disaster. I see three impacts from the Y2K scare. Second, I believe that the massive amount of expenditures made all at the same time to update computer hardware and software has created (or enhanced) a new economic cycle of boom and bust. Let me point out here that I’m not an economist. I don’t pretend to be one. I’ve never read an article that discussed what I’m about to say. I’m just a guy who has lived through some events and put some pieces together. Here’s what happened in the run-up to Y2K. IT departments were staffed to the rafters, and computer hardware and software companies had an unprecedented boom because of expenditures made to avert the Y2K problem. Everything had to be in place by January 1, 2000. When it was over, it was over. Business and government now all had new computers and software, forcing a very artificial arrhythmia in the normal upgrade cycle for hardware and software. No one was going to be in the market to buy new stuff for another three or four years. Three months after the world stopped spending money to upgrade computer systems, in March 2000, the “dot-com” bubble burst. Over the next two and a half years, the stock market lost five trillion dollars ($5,000,000,000,000.00) in value. Telecommunications company World.com was one of the most notable to fail, filing the third largest bankruptcy in U.S. history. Coincidence, or cause and effect? The dot-com bubble was followed by the housing bubble in 2007, which is the cause of the Great Recession that started in 2008 which bankrupted our federal government and has never ended. I predict more bubbles to burst in the days to come. The next one may be the personal debt bubble, perhaps led by the school loan bubble. People can’t find jobs, so they take out huge loans and go back to school. When the jobs still aren’t there, they’ll default on the school loans, bursting that bubble. China’s booming economy may be all smoke and mirrors, too. We’ll be posting a shocking video of a story that ran on the TV show 60 Minutes that will make your financial toes curl. (No, not in a good way.) But to sum this second point up, I believe that the expenditures made to prevent the Y2K disaster from happening set up (or at least exacerbated) a series of boom and bust bubbles that will eventually bring down the global economy. So Y2K didn’t pan out to be the global disaster that it was warned could happen. I believe that’s because it was caught and fixed in time, but with repairs that have caused these three long-lasting repercussions. I saw the potential for hardship that Y2K posed, so I was among those who sounded the alarm within my circle of influence, and I took some baby steps toward personal preparation. They really wouldn’t have served me well or for very long if I had needed them. We all need to do much better now. But 13 years later my take on Y2K hasn’t changed. I believed then, and I maintain now, that Y2K was a wake-up call, a “dress rehearsal,” for what is to come. Golfers take a practice swing before they step up to hit the ball for real. I got a practice swing during Y2K. Now it’s time to get ready for the Real Deal. Preparing for a time when life is no longer as convenient and food is no longer as available as it is today can be quite overwhelming. We’re here to help! You’ll find information on a wide range of topics on this site. But where do you begin? Getting started with prepping is challenging because there are so many areas to evaluate and take action in. This article provides a logical approach to prepping by linking to “the basics” posts. 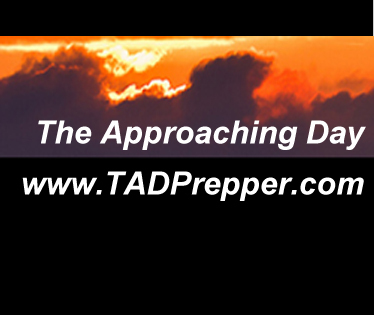 Prepper Tip: Don’t get overwhelmed, don’t get discouraged, and don’t get anxious. What’s the answer to the age old question “How do you eat an elephant?” One bite at a time, my friend, one bite at a time. That’s how you approach prepping. Take a deep breath and then dive in. If you’re just getting started in prepping, start at the beginning and move through to the end. By the way…We’re still working on this page, so not all links are active. We’re confident you’ll find lots of useful info here so we wanted to make it available while we’re working on it. Approaches – This blog introduces the different types of food that can be stored and provides the best place to start. How do I develop a priority list so I have a plan and work toward getting the most important stuff first? It’s enough to drive you (and everyone around you) crazy. So let’s keep calm, take a deep breath, and take a couple of baby steps toward preparedness. Some people try to prep themselves for global thermonuclear war before they’re even ready to “survive” something as simple as a short-term power outage. We’re going to start small. The most common emergency situations that most people will ever face are relatively minor ones. One of the most common is a power outage. Your electricity could go off for a couple of days because of a storm, a transformer malfunction or any of a number of reasons. A short-term power outage isn’t really a big deal, but it can cause a significant disruption in your life. I can deal with sitting in the dark with no TV, but because the lights are out, my furnace is no longer working. Until I save enough to buy that wood-burning stove I’ve got my eye on, I’m going to need to resort to more basic means of staying warm. Electric stoves and microwave ovens are no good in a power outage, so I’ll need a way of cooking food. And I’m much more likely to hurt myself in the dark, so I’ll need some first aid supplies. You get the idea. 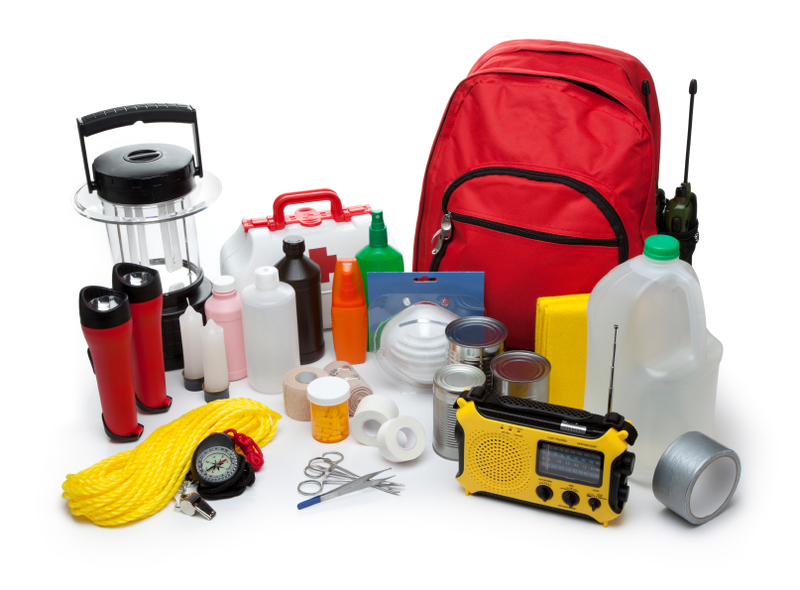 Click here to see an assortment of kits sold by Emergency Essentials , one of my favorite prepper resources (the photo above is a stock photo — it’s not one of of the Emergency Essentials kits). At the time of this writing, Emergency Essentials sells four different grades of 72-hour emergency kits. The most basic is just called an emergency kit, but the better-equipped models have brand names like Trekker™, ReadyWise™, and Comp™. The one that I think gives the most bang for the buck is the ReadyWise™. What’s in a good kit? Let’s take a look at the kinds of things they stock the ReadyWise with. First, you’ll find food in the form of a few MREs (Meals Ready to Eat) and a high-calorie food bar. You can eat MREs as-is, but keeping up your marale is important in an emergency, so they also provide MRE heaters and some hard candy. Next comes water. Besides providing packaged water, they give you a water bottle and some water purification tablets. Getting cold? The kit includes a wool blanket, hand and body warmers, a poncho, and emergency sleeping bag, and a tube tent. For light, they give you a hand-crank powered flashlight that can also recharge your cell phone, a light stick, and a 100-hour candle. To let you know what’s going on in the world, they include a battery-operated radio (and yes, batteries ARE included, but you need to make sure to keep fresh ones in stock just in case). There’s also an assortment of first aid and personal hygiene supplies. All of this comes bundled in a lightweight backpack for easy portability in case you have to bug out and drag it all with you. I think that’s a pretty darned good 72-hour emergency kit. Could you do better? Probably. In my opinion, no emergency kit is complete without a couple of good knives. This kit doesn’t have any. And I’m sure that you could find a better radio (maybe one that’s powered by a hand crank or solar panel rather than batteries ). A real sleeping bag would be better than the emergency one that they put in this kit — but it’s going to be as big and heavy as this entire kit is, so there are trade-offs. And I’m dead certain that the multifunction tool included in the kit isn’t the best one on the market, but buying the best one will cost you as much as this whole kit does . Do you really need a really good multifunction tool? Yes, I think you do. But do you really need a really good multifunction tool for a 72-hour emergency kit? Nope. That’s overkill. Sometimes “good enough” is good enough. Looking at ways to improve upon Emergency Essentials’ ReadyWise emergency kit is a good lesson in prepper priorities. We could buy a reasonable priced, quick-and-dirty kit that is very appropriate for the purpose it was created for. We could assemble our own collection of top-of-the-line components. Or we could buy the kit and supplement it with a couple of better-quality pieces here and there. The choice is yours, of course. Yes, it’s possible to put together a “better” emergency kit than this one, but if you’re the kind of person who likes one-stop shopping, this is a good solution for you, and a good starting point for your preps . Prepper Tip: One great way to make a significant dent in your prepping needs is to purchase one full kit (remember, it comes complete with a carry bag) and build your second kit. That’s what we often do. It allows you to see everything provided in the kit and base your second kit on the strengths and weaknesses of the purchased one. In a previous blog I addressed the basics of a revolver as a personal defense tool. In this article we’re going to look at the other type of handgun: the semi-automatic. If you’re new to guns, most of what you know (or you think you know) comes from movies, TV, and the news. These are probably the three worst sources of information about firearms. Prepare to unlearn most of what you’ve picked up from them. If you say “semi-automatic” to newbies, they think “machine gun.” Pull the trigger and a stream of bullets erupts from the gun, continuing to fire until either you manage to get your finger off the trigger or you run out of ammunition. Right? Because this is the mental picture that many people get when the term “semi-automatic gun” is used, it’s no wonder that so many well-meaning but misinformed people are in favor of more strict gun control. I would be too — if it were true. The “machine gun” that we’ve just described is not a semi-automatic. Machine guns are fully automatic. They exist, but they’ve been illegal for civilians to own since the 1930s. This is one of the many reasons why responsible gun owners say that we don’t need new gun laws; we just need to enforce the laws that we already have. 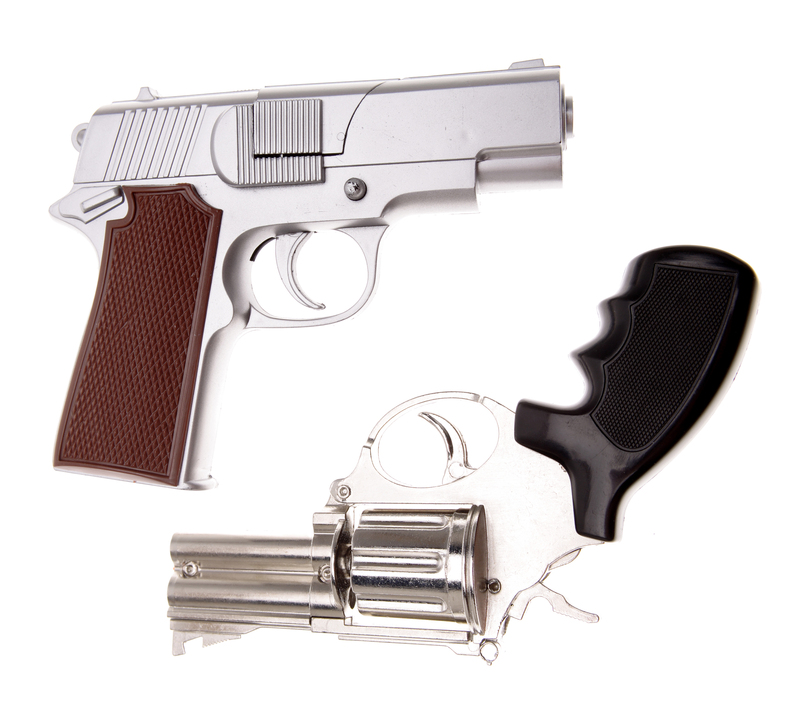 What makes a handgun a semi-automatic is that when a bullet is fired from the gun, it loads the next available round into the chamber to be ready to be fired. The recoil from the gun pushes the “slide” (the top part of the gun) to the back and ejects the empty casing of the bullet that was just fired, allowing the next round to be moved into place to be ready to fire. Here’s a pretty good YouTube video that demonstrates how a semi-automatic handgun “cycles” from firing a bullet to reloading the next available round. Watch as the entire process of pulling the trigger, cocking and releasing the hammer, firing the bullet, ejecting the spent bullet casing, and loading the next round is repeated through several trigger pulls of the trigger. To repeat, semi-automatics are not machine guns. Only one bullet is fired each time you pull the trigger, no matter how long you hold the trigger back. If you want another bullet to fire, you’re going to have to do something to make it happen. After the last bullet is fired, with most semi-autos the slide will lock in the back position, showing you that the gun is now completely empty. Semi-autos are a bit more complicated to operate and maintain than a revolver because of all the moving parts that are involved in cycling the gun to eject the fired bullet casing and to move the next round into firing position. Nevertheless, they are simple enough that a responsible and mature child of about age ten can be trained to use one safely with responsible adult supervision. So if a semi-automatic handgun is more difficult to operate and maintain than a revolver, and if your misinformed family and friends would think that you own a dangerous machine gun that should be banned (helpful reminder: machine guns have been banned for almost 80 years), why would anyone choose to own one instead of just buying a trusty revolver? I think the biggest advantage is ammunition capacity — one of the very factors that the gun control advocates has such a problem with. Semi-auto magazines come in a wide variety of capacities, based on the physical size of the gun and the caliber of ammunition used in it. The larger the gun the more bullets it can hold (generally), but the higher the caliber the less it can hold. If you want a small gun for concealed carry, you’re going to have to live with less rounds of ammunition. There’s just no place to put a lot of bullets in a sub-compact gun. If you want to carry a high-caliber gun, such as a .45, you’re going to have to live with less ammo. Those big bullets take up a lot of space, so a .45 generally doesn’t carry many. For both of these options (small gun or large caliber), you’ll be looking at guns that hold seven or eight rounds. But with all the variations of gun size and calibers, there are plenty of choices. The highest standard ammo capacity of any handgun that I’m aware of is the Kel-Tec PMR-30. It holds 30 rounds of .22 Magnum. I want one. It’s a gun you load on Sunday and shoot all week long. By comparison, a typical full-sized 9mm semi-auto will hold about 15 to 17 rounds of ammo. Why is a higher ammo capacity such a plus? Because handguns are hard to shoot well. You need training before you ever consider buying and using one, and then you need regular practice to maintain your skills. A low-powered rifle, such as a .22, is very accurate at a range of 100 yards or more with very little practice. With a handgun, you have to practice a lot to become a good shot at 10 yards. This is why some folks define a handgun as a tool that you use to fight your way back to your rifle (which you shouldn’t have put down in the first place). If you’re in a situation where you need to use a handgun for self-defense, you will be under the greatest stress of your life. Even though you’ll be at close range (most self-defense shootings occur within seven yards), the stress can cause you to miss your target unless you are highly trained. Even police officers average a first-round accuracy rating of only something like 50%. If you’re carrying a 5-shot revolver, you’re going to have very little margin of error for stopping your assailant. Forget a warning shot — you’ve just thrown away 20% of your ammunition. (Warning shots are a very bad idea for a number of reasons, which we’ll go into in a future article.) And if you’re defending yourself from more than one assailant, you’ll need to be packing more ammo than a revolver can hold. The weight of fifteen rounds in a semi-auto may not be comfortable to carry, but it’s very comforting to carry. This is running long, so I’m going to wrap it up here, but in my next article on semi-autos I’m going to discuss why a semi-auto can be more accurate than a revolver. This is another reason why someone would choose a semi-auto over a revolver. When planning your long-term food storage, don’t forget to include basic ingredients such as sugar, spices, and salt. These can all become very valuable for bartering with people who overlooked stocking up on the basics, and they can make your own life much more normal during periods of long-term scarcity. How much do you need to stock? More than you think you do. Today we’re going to focus on salt. Salt is one of the things that made civilization possible. Sure, it makes food taste good, but its real value is in it’s ability to preserve food. When you can preserve surplus food, your chances for survival through a tough winter, summer drought, or other disaster or emergency go way up. In the right proportions, sea salt has small amounts of essential nutrients that the body needs: iodine, iron, magnesium, calcium, potassium, manganese, and zinc. We all know by now that too much salt has adverse health consequences, so keep that in mind as you plan your emergency food strategy. Your body may need some extra salt during times of emergency stress and manual labor, but don’t let that become an excuse for overdoing it. Some freeze-dried entrees are overly heavy with salt. We’ve found that using the entree as a topping for pasta, rice, or potatoes not only cuts your salt intake, it also stretches your food supply. Today, we manufacture so much salt, and so many different kinds of salt, that it’s easy to take it for granted. But imagine there is no more salt. Well, there is salt, but it’s in the ocean. How do you get it out? For a look at the modern process, check out this on-site tour from: www.theKitchn.com. Can you harvest your own salt? Sure. And the good news is, it’s easy. The hardest part is that you need to find a source of clean seawater. That’s a lot easier for people living near the coast than for most of us. Beware: Seawater is not the same everywhere. Ensure you’re using clean water that contains no runoff or chemicals. This eliminates public beaches and seawater from harbors or near industrial operations. Collect your water as far away from civilization as possible. You’ll get about 2 cups of salt per four gallons of water, so even though it’s a time-consuming process, the return is worth it. Do you live too far inland to make harvesting your own sea salt feasible? You still need to stock up. Here’s a link for a good long-term storage option . It’s for regular iodized salt, not sea salt. For information about preserving food with salt, check out this site: http://www.ehow.com/how_2123649_preserve-food-saltcuring.html.